Prince William has started full-time studies on an agriculture course at the University of Cambridge. The Duke of Cambridge arrived at the university by public transport on the 09:44 service from London King’s Cross. Prince William will take a 10-week course in agricultural management, organized by the university’s Programme for Sustainability Leadership. The course is designed to help him for the time when Prince William inherits the Duchy of Cornwall estate from his father. He is expected to make the 46-minute train journey several days a week but also has the option of overnight accommodation in Cambridge. 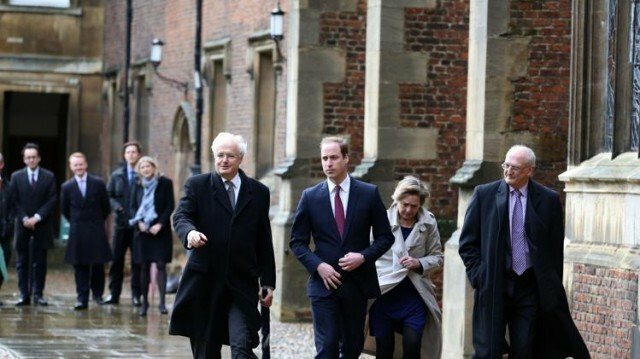 Prince William was greeted at St John’s College, where some of his tutorials will take place, by vice-chancellor Sir Leszek Borysiewicz, along with Master of St John’s, Prof Christopher Dobson, and Polly Courtice, director of the Programme for Sustainability Leadership. The royal toured the college’s grounds, where he stopped to look at a plaque marking the Queen’s visit there in April 2011. The course, which ends in March, has been designed specifically for Prince William but he will study alongside PhD students in some classes. Prince William will be taught by academics specializing in geography, land economy and plant sciences.